For the past three days, the capital of Greece, Athens, has been rocked by demonstrations and rioting as thousands have taken to the streets in protest at the fatal shooting by a police officer of 15-year old Alexandros Grigoropoulos in the Athens district of Exarchia on December 6, 2008. The unrest quickly spread to Thessaloniki, the country's second-largest city, and other parts of the country. Clashes have also taken place in parts of Cyprus. In central Athens, protesters, including high school and university students and anarchists, have battled riot police, smashing shop windows, burning vehicles, throwing petrol bombs and Molotov cocktails and setting public buildings on fire. Mourners and protesters also clashed with police after Grigoropoulos’ funeral on Tuesday. The disturbances are said to be the worst to hit Greece since the collapse of military rule in 1974, and point to widespread dissatisfaction with the government of Prime Minister Costas Karamanlis which holds on to power by a one-seat majority. The main opposition party has called for early elections. See the Wikipedia entry on the 2008 Greek riots for more information. Indymedia Athens (some English) have extensive coverage from the front lines, including dramatic photos of streets on fire, and links to video with sounds of gunfire. I suffered a dislocated shoulder, fractured nose and multiple cuts and bruising for taking these photos of the Greek riot police during a peaceful demonstration on September 8th, 2007, Thessaloniki, Greece. I was detained, placed in an unmarked van by the four plain clothes cops and taken to the central police station. Later I was released without charge, but in excruciating pain and covered in blood. ThirdEye3 on Flickr has photos of protesters holding posters with a photoshopped image of a gun to protest the police shooting, and a photo set tagged #griots. 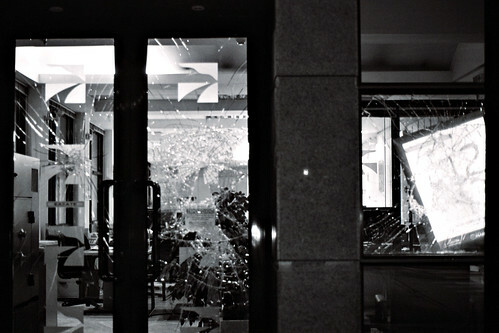 dkilim has photos of post-rioting devastation. There are many more photos on the Flickr pages of tom.tziros, Λεωνίδας, and murplej@ne – under deconstruction (this photographer also has a blog at Trainstorming). Sameer Padania from WITNESS’ human rights video website The HUB happens to be in Athens for a media conference and has uploaded more than a dozen brief videos of what he saw on the streets. Videoonthecloud has uploaded a couple of videos to YouTube, including this one of police throwing a stone at a protester. There are many more videos to be found on YouTube by searching for #griots. Georgia Popplewell and Renata Avila contributed text and links for this post. We in America support the Greek Revolution! I have done my best to support the Greek youth by sending numerous emails, and placing numerous phone calls to Greek consulates in in the U.S. I want to be able to speak directly to the protestors. There are reports in the media here that the Greek Police are running out of tear gas. Stay strong and keep up the pressure and you will prevail!! If you haven’t read Naomi Klein’s The Shock Doctrine, you need to read it and you will see the actions in an entirely new light. I support the protests (not so much the riots), but there has to be a unified voice with a clear idea of what to fight for. It’s not enough to say that you are dissatisfied, you need to work together to push through an agenda of wide social change. Drive the IMF from Greece and be willing to take the economic hit in order to rebuild the social system that will benefit the majority, rather than the wealthy minority.